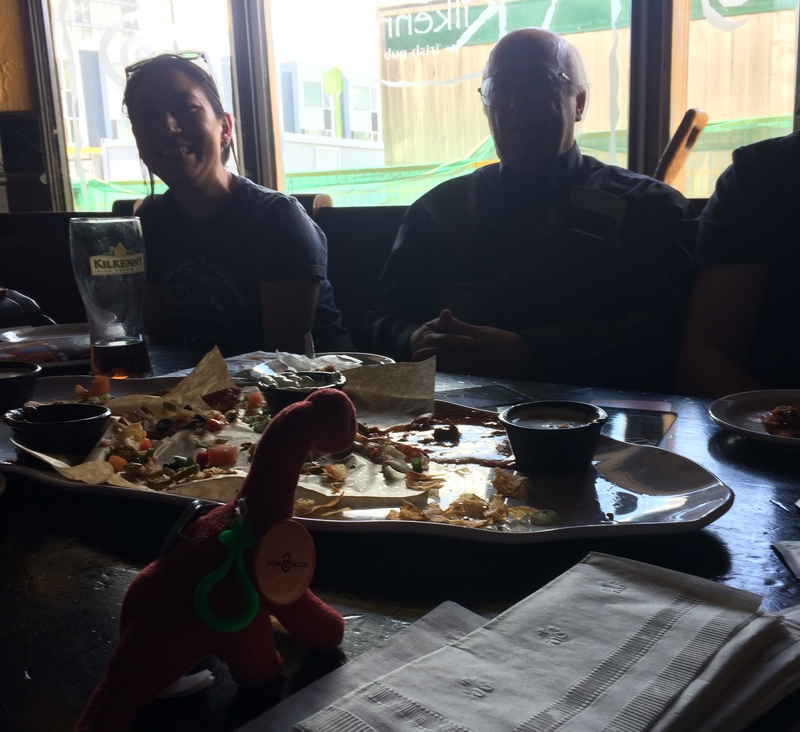 Liz got to meet up with the Alberta Aurora Chasers, see aurora on her first two nights in Canada (including a dream come true, her first sighting of STEVE! ), and have daytime fun too. Here’s her account! I left Maryland early in the morning to arrive in Calgary early in the afternoon. I had just enough time to change into my aurora dress and catch a meetup of the Alberta Aurora Chasers, fortuitously timed for my arrival. It was at the Kilkenny, site of the earlier now infamous meetup. When I arrived Chris, Laura and Jun were already there. Later on Roland, Alan, Bea, Gareth, Eric, and Chandresh all arrived. 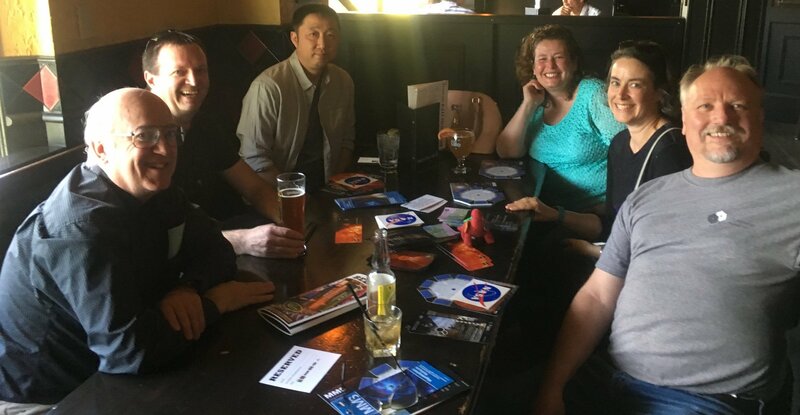 We caught up, admired photographs, distributed some NASA goodies I had brought, and shared nachos. I was excited to learn from Jun that the colors of STEVE, particularly the picket fence were not visible to the naked eye. We discussed the chance of a small event that evening due to the arrival of a coronal hole with high speed solar wind. Bea, Laura, and I (all scientists) made a plan to try to go out together. Rory was a little hungry having been on airplanes all day. We talked for 3 hours… then I took a long nap. I awoke and started texting Laura and Bea. Would we really meet up? How so? I was on the fence but decided to go for it, since the data were looking so good and since Laura and Bea had never seen aurora before. Also, I really wanted to see STEVE of course, though I knew that was not very predictable. The plan was elaborate but worked well. I caught the same C train Bea was already on, and we proceeded to the Tuscany end of the line. There we were met by Laura and started to drive further from city lights. Soon we were pulled off the road staring at the sky, fiddling with the tripod… we weren’t so successful and decided to proceed immediately to “the” spot recommended by Chris, the Twisty Road Pond. And Chris Ratzlaff himself was there along with ducks and frogs singing spring songs. There were lots of cars and people with lawn chairs. It was an aurora party, albeit a quiet one! And the aurora was a faint quiet arc glowing on the horizon. STEVE had shown up further East earlier in the night, and just the faintest remnants were visible according to Chris. It was a good night to practice with one’s camera. 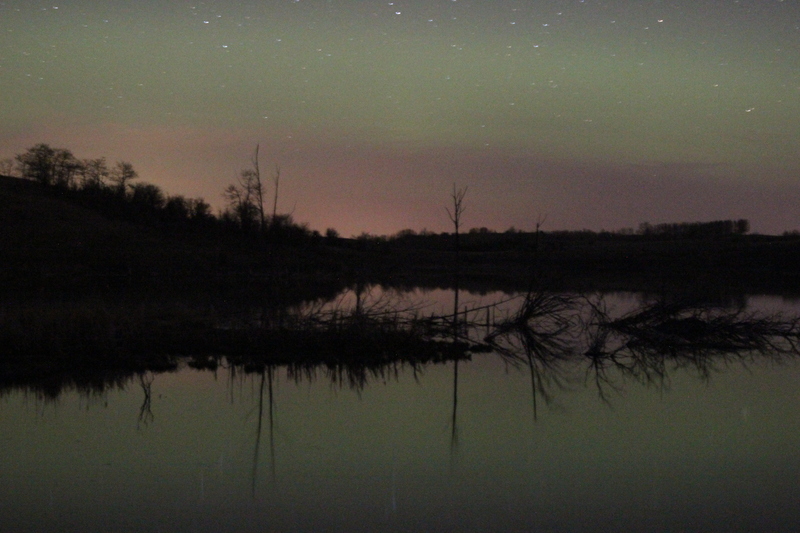 With Chris’ expert advice, Laura was soon lining up in focus aurora and stars plus nice reflections in the pond. We played with some selfies and generally had a great time. Since we are scientists not aurora chasers (and since I had to get up for the ski bus in the morning) we didn’t have much stamina and left early, just before 1 am. It was remarkably quick to get back into Calgary. Shortly after we left more people showed up and a substorm exploded of course. It was AMAZING how close it was and how many people were there. 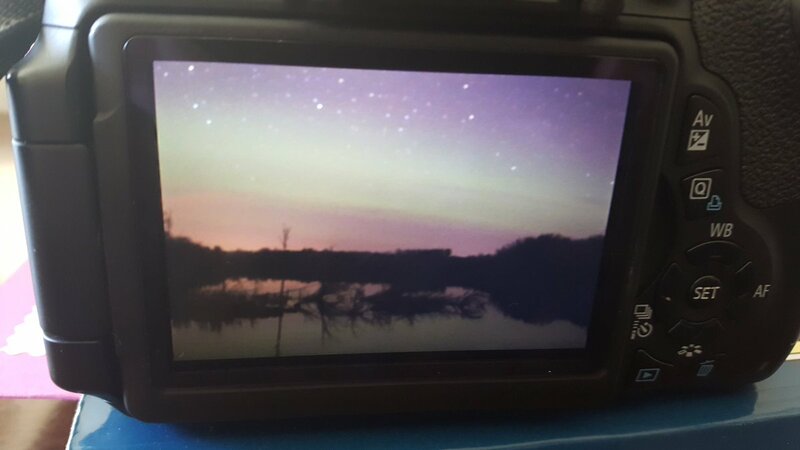 I was super excited to learn in person how relatively easy (and still under-recognized) it is to spot aurora from Calgary. Laura made her first report to Aurorasaurus. The next day I did make the ski bus and met up with my skiing buddy aka U.C. Prof. Dave Knudsen. 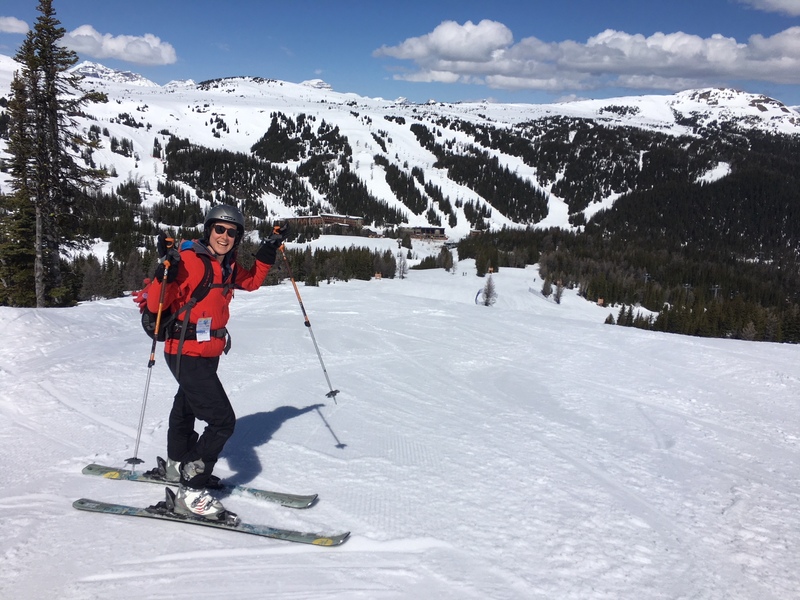 The snow and spring conditions were fantastic. Our legs and noses were burning and there was still time for a long nap when we quit. This was was great because the storm was ongoing. I met up with Los Alamos colleagues in Banff, and told them I would send an email if there was a chance for aurora chasing. I was excited because two of these colleagues had never seen aurora and I knew there was a good chance. Once I figured out that a nearby viewing place was only 20 minutes from our hotel, I knew we had to try. Liz & Rory enjoying fine Canadian spring skiing at Sunshine. Photo by Dave Knudsen. We had one full car and went to Lake Minnewanka, the Banff equivalent to Twisty Road Pond, around 10:45. We went around the lake, and there weren’t many cars. But as soon as we got out of the car around 11:10 pm and looked up, I thought that might be STEVE. A few moments later, as I saw the broad light silver arc moving gracefully across the sky, I knew it was STEVE! I felt so incredibly lucky to be seeing it, I couldn’t believe my eyes. More cars showed up and we watched STEVE move and slowly shift south for almost an hour. The aurora was to the north but not doing too much there. Only one of the 5 scientists had a camera and she valiantly tried to get some good shots but her camera was acting up. You could not see the different colors by the naked eye but I knew they were there. I could tell that the picket fence structure was there and moving. It was a spectacular night to watch @STEVEphenomena, captured in this Twitter moment. When we showed up the arc was covering the Big Dipper directly overhead, and by the time we left, it was just entirely below the Big Dipper. It was definitely there the whole time and dynamically moving, even showing a bit of high speed flickering at one point. “How did we miss this?” I thought, thinking of our paper showing that STEVE actually corresponds to a subauroral ion drift (SAID). There are many reasons… but that is the topic of another post. It is notable however, that the STEVE structure is quite white to the naked eye and the different purple and green features cannot be distinguished though they can both be seen. Christine Gabrielse captured STEVE and the picket fence. We had a good conversation with a friendly security guard who was also watching the STEVE. He told us how there is a flooded town at the bottom of the lake, and said he enjoyed our nerdy talk about what causes the aurora. The next night, it was raining. 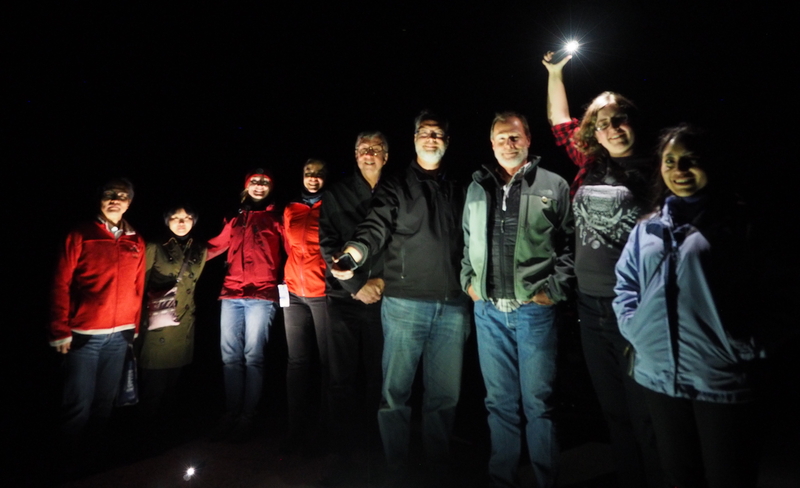 On the last night, 3 cars of scientists and significant others turned out to try to see the aurora. But it was not in the cards, unless we were to stay out until 2 am. 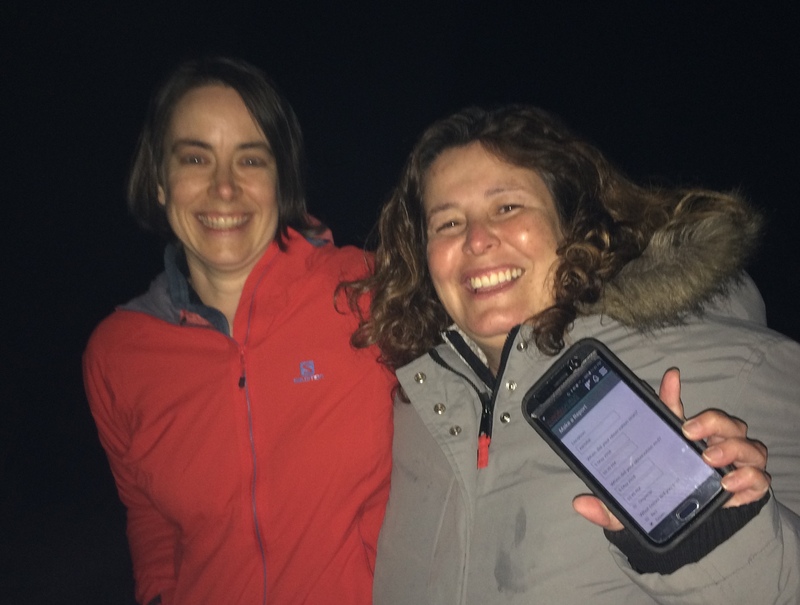 We were not too prepared for the weather and had the meeting the next day though, so we just enjoyed seeing the brightness of Jupiter and had a fun night-time selfie on the lake. In the days since then, this particular high speed stream has persisted and produced at least 3 more visible STEVEs, likely because high speed streams of solar wind are particularly good at producing substorms and SAIDs are associated with substorms. This weekend has capped off the recent publication of the STEVE paper, in the most spectacular and gratifying way. I was in town for work, at a very small workshop in Banff. Ironically at that workshop we talked about how difficult it is to know (in space, in the magnetosphere) what causes even the most straightforward of auroral forms, like the quiet arc. We are working on new techniques to aid with understanding how the visible aurora maps to the drivers far out in space. And now, more of us know what we are looking for. 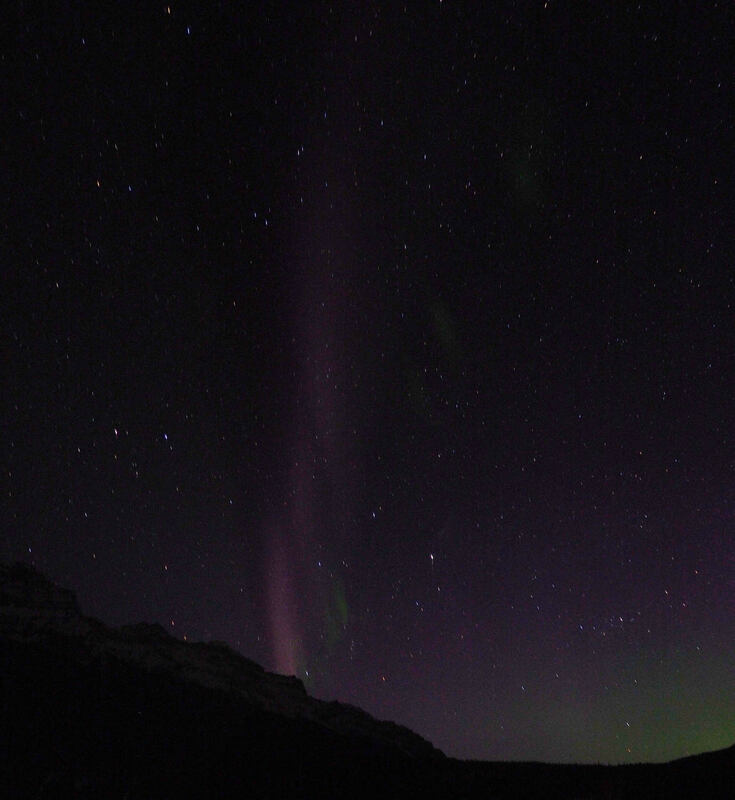 This entry was posted in Chasing the Aurora: First-hand accounts from our users. Bookmark the permalink. I am very happy that you laid eyes on Steve while you were here! I am happy you were able to meet with AAC and go to Banff.